For starters, it never stops being convenient. Just the way it warms you up after a day skiing, your slow cooker can deliver an easy, nourishing meal after a soccer game or a day at the beach. And no, you don’t have to be eating beef stew in August. Recipes like Pulled Pork with Caramelized Onions (pictured) are great for summer. Just top it with some cool and crunchy slaw and a tart pickle and you’ve got yourself the perfect summer meal. Or make meatballs in your slow cooker for a crowd-pleasing meal. (Try this recipe: Nonna’s Spaghetti & Meatballs). Pair that with a salad and you can’t possibly go wrong. So think outside the box and get your slow cooker back in the kitchen this summer. Get the Recipe: Pulled Pork with Caramelized Onions—Traditional pulled pork is barbecued, which gives it a smoky flavor. 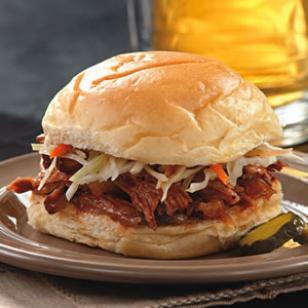 But the slow cooker happens to be the absolute easiest way to cook pulled pork—and you can get a hint of smoke by adding chipotle chile.